This post is very off topic. Also: this post will *describe things which people sometimes assume they know, or do know already*. I have found that most mathematics training does not really deeply teach people the distinction between interval and difference, for example, though in some applications we use them quickly and do remember that they are different. In order to help readers who do not deal with such things in a regular way, deeply ingrained from understanding and training and use (or some combination of these), I have written out various things as I go. One item treated this way is that an interval is a number of only the numbers between two numbers, and difference is the spaces, which are numbered as numbers as well, at the end of the spaces in the number line, and include the last space's number (the final tally in the series); another way to put this is that the difference starts just after the lower number and ends *at*, including, the upper number. Some of us will possibly run into problems imaging what will follow about squares ("perfect squares") in the number scale, if these facts are not remembered. For those who have no problem not only sometimes using but remembering the difference between "difference" and "interval" and so on (enough to remember the difference -- ha ha), just allow for these explications (unfolding, fleshed-out descriptions). Some others who read to have these reminders spelled out which you have gained such accurate facility in. The main points will still be new to you, I believe. Best wishes to all kinds of readers. We all know that even squares are related by being divisible by 4, with their differences (the intervals when you subtract a smaller one from a larger one, but numbered completely up to the upper number and including it) being uneven sets of 4 (multiples of 4, but uneven sets, that is, 4 times an odd number). What about odd squares? They seem to have no relation. Some are factored by other odd numbers than the root: those are composite odd numbers. These squares have roots with "roots" in odd numbers multiplied together. Some are prime odd numbers (where no smaller multiples combine to make them: they are divisible by only 1 and themselves). And the ones with odd number composite roots, are squares which do not relate to all other odd squares based on their roots. In other words, all even squares share a relationship in their roots, where the roots (and they, themselves), are at least divisible by 2. No fractional numeric representations are necessary for them. The numbers are representable in whole units of 1, also when divided in half. Odd numbers, of course, are not. Odd roots and odd squares are both odd. This is a basic relation between odd squares, but that would seem to be it -- the only relationship they have. Squares of numbers divisible by 3 and odd as well (3, 9, 15, 21, etc. as roots of squares), involve such a small portion of the odd number scale (3) that they have their own pattern, which I will not go into here. But what I discovered is that the odd numbers from 1 as a start point, on up through 5, 7, 11, 13, 17, 19 ... do have a relationship when squared. Squares always involve only the factors (the numbers multiplied together) which made the original square. For a prime number (say, 17), the factors (divisors) of that square will be only 17 and 1, just as with the root. For a composite number (say, 15 or 18 or 35), the squares of those numbers will also involve only factors which went into the roots: 1, 3, 5, 15 for 15; 1, 2, 3, 6, 9, 18 for 18; 1, 5, 7, 35 for 35 ... when squared or a root. That relationship between odd-number squares, when 3 is not a factor, is deeply intuitive -- so much so that it is superficially counterintuitive: odd roots (factors) for squares have odd and odd factors themselves, some being primes as well. So ... where could there be a common link in these squares, besides their being odd? The commonality occurs in the differences between those odd-number squares, the intervals between these squares including the upper square of any two of them. So: subtract a smaller "non-3" odd square (a square whose root and therefore whose self, as a square, are not divisible by three), and subtract it specifically from another "non-3" odd square, and that total will be ... related to all other non-3 odds, forever. What is that relationship? The simplest part of it, is that they all have differences related to 12, doubled, which means that all of the differences between their squares have a difference of some multiple of 24. The pattern in how many 24s fit between those odd squares (the ones not divisible by 3, in root and therefore also not in square), is itself interesting. They relate to the numbers which actually create squares. Squares are also called, by mathematicians, "perfect squares" or "power of 2". I will call them squares during this section. We will cover what the pattern is and why it is interesting. -- But from this point forward, my edit of August 2016 ends. The more awkward language of when I "bashed out" (rushed out) the original page, follows. I had had the work done for some time, but was in a hurry finally to get the page up. Discovery: Differences between odd squares, discounting multiples of 3, and initial 1, are all divisible by 24, in a pattern alternating all odd multiples of 24 with all multiples of 24. Thus: Other than 1, any odd square not divisible by 3 - (i.e., minus) next odd square below not divisible by 3 = divisible by 24. And: Pattern of these differences is 1, 3, 5 ... *24 alternating with 1, 2, 3 ... *24.
odd roots do not reconcile to each other: some are primes, some composites but not all of each other. Yet here the odd roots, when squared, do reconcile: in their differences. v) Which is like saying the differences in the roots of non-3 odds (different by 4 and 2, alternating into infinity), each of which is a double or half of the other. The reason to relate it this way is that 2 and 4 are consistently the difference in the roots for non-3 odds, and the relation of the amounts of 24s in the differences in the squares for non-3 odds also relate to the root difference. Understanding number's processes by nature of powers (squares are the 2nd power), helps in finding applications. it is common now to speak of the universe's functions (energies and "dimensions" of power for its existence, if one can call time and space "powers", but they are), as if they are in dodecahedron relationships. I think this is a byproduct of the interrelationship of number powers themselves; they function in relation to 4 and 3 in special ways (for squares, the most basic power other than 1, and in increasingly "chaotic", i.e., different but related ways -- yes, all related to the number 4 still), which I won't get into here, but suffice to say that the even squares come in on multiples of 4 in difference from each other, in odd sets: 0--4 is 1 4, 4--16 is 3 4s, etc. There is much to be said about what happens for the 3s, which I will leave at this time. This relationship to 4, in squares, manifests as differences in multiples of 24 for non-3 odds as roots as well, and makes them give the "dodecahedron" effect in the math of the universe, too, I think. It also may be why the ancients were interested in using base-60, or were given that method, if "weird theories" are to be included in our discussion for interest's sake, for fun (the "Atlantean" or other lost-civilization diffusion theory, or even, for some people, the "alien intervention" theory, or some combination of these). 60 is a link between base 10, and base 12 through its half (6), and halves and doubles with the ability to represent a half-unit inside a basic unit as well, are related to 1, 2 and 4. If 2 is the unit, 4 becomes the first double, and if our unit can also represent its own half, 1, we have a system which interlocks 1, 2, 3 ... as a concept (as 2, 4, 6 ...) with .5, 1, 1.5. And of course in regular units, we can't express ". "-anything, since our first unit is the concept 1. So if we move to 1, 3, 5 ... as half-unit expressions, combined with 2, 4, 6 ... as whole-unit expressions, we are okay (and this is what numbers do, of course). But when linked as 1, 2, 4 ONLY and explicitly, the relationship of odds to evens is heightened for us. Squares have this built into their pattern very explicitly. And I think it's what's giving the dodecahedron mathematical result in some ways, for the universe scientists. And since for non-3 odd roots, the even numbers on either side always include a multiple of 3 and a multiple of 4 on either side, the result will be divisible by 12 (in fact, by double 12, or 24). However, the specific pattern between the non-3 odd squares is itself a feature of the skipped numbers in the roots. Going up 4, 2, 4, 2 into infinity (1->5, 5->7, 7->11, etc.) gives the spacing for the numbers of 24s between the non-3 odd squares. This is an oversimplification, not a complete proof, but it should give the gist of how this happens. What sets Pythagorean triples apart from other squares, in the process of their creation up the number scale. and then multiplying that result by c-b itself, gives the square of a. Of course this can also be done in the other order, where we multiply c-b by 2, then multiply that by the integer or fraction sitting at the halfway point between c and b. Thus: 2n*(c-b)=a squared, where n=the number at halfway point between b and c.
gives us the "a" in our a,b,c triple, but gives it to us squared. 1. i) a, b, c in a Pythagorean triple are roots, of course. They are numbers from units on the sides and diagonal of a rectangle (and the special case of a square is slightly different, and we will wait to get into that), where the units for each side all relate as whole numbers. These roots have special properties. One such property is that a, when squared, becomes the difference between b and c, when these are squared. This is known as the Pythagorean theorem, that a squared plus b squared equals c squared. Or, to put it another way, c squared minus a squared leaves b squared. 1. ii) Also, any three numbers, multiplied by the same amount, leaves the same proportionality between them. So, if a number, say, half way between b and c of any three numbers (not only a Pythagorean triple), were multiplied by the same amount as b and c were, then that number would remain half way between the new composite (multiple) of b and the new composite (multiple of c). 1. iii) However, when any two numbers are squared, of course, the second number is multiplied more than the second number. For example if b and c are squared, the second would be c.
and c is multiplied by b+1, if c is itself b+1. This holds for all numbers, of course. 1. v) Some Pythagorean triples (primitive or not) use b and c which are more than one apart. We have already seen one: 6-8-10, where 8 and 10 are two apart (b is 8, and c is 10, and b+2 is 10). But the first primitive triple which has a difference between the larger amounts, which we will call b and c respectively, is 8-15-17. 1. vi) If we multiply b and c in a Pythagorean triple by the same amount, the halfway point between b and c, no matter how much difference is between them, will remain at the halfway point when we multiply them. 1. vii) And of course, if we multiply to the squares of b and c, the half-way point between them is no longer a multiple of the original halfway point between the roots b and c. This is because b and c have not been multiplied by the same number, so the halfway point in the difference of b squared and c squared has shifted higher inside the difference than it was; the half-way point between the squares of b and c is therefore NOT anymore a multiple of the original halfway point. 2. i) Something wonderful occurs if the number we multiply b and c by is the difference between b and c times 2. 2. ii) The half-way point between b and c of course is still a multiple of the half-way point at half-way between the new b (the multiple of b) and the new c (the multiple of c), but the half-way point is now a squared as well. So, for example, 4 and 5 multiplied by the difference, which is 1, of course leaves us at 4 and 5. The half-way point (4.5) remains 4.5. Multiplied by 1*2 (that is, multiplied by two), gives us 9 at the halfway point. 4 becomes 8, 5 becomes 10, and the halfway point in the new difference of 2, is 9. 9 is 4.5 times two, and two is itself the difference between 4 and 5 (which is 1) times 2. 2. iii) But 9 as 4.5 times 2, is also the first time when what our Pythagorean triple root "a" shows up between multiples of 4 and 5. Of course, 3 is the root of the difference between the squares of 4 and 5 (which are 16 and 25, respectively, and have a difference of 9). In other words: by multiplying by 2 every time, no matter what the difference, we get half-units, but this does not mean we simply multiply by 2; we use the difference itself, which if anything greater than 1, will actually mean we multiply by MORE than 2 in fact. For an example with a greater difference between b and c, we may look at 8-15-17. The difference between 15 and 17 is 2. Multiplied by 2, it is, of course 4. Multiplying 15 and 17 by 4 gives 60 and 68. Their difference is now 8, and the halfway point is 4 away from 60 and 68, respectively, between them. This gives us 64 as the halfway point. And 64 is, of course, a square, and the square is the same amount as will become the difference between b and c when these reach their own squares. It is also the first time when the root of 64 (which will be our "a"), appears between b and c in a multiple. Yet it appears first, here, in a process whereby 16 is multiplied by 2 times the difference between 15 and 17 (which means multiplying 16, the mid-point between 15 and 17, by 4). We did not reach 64 by multiplying 8 by itself (i.e., 8 squared). Remember, we reached the square of 3 by multiplying 4.5 by 2, which is two times the difference (i.e., 1) between roots b and c, which were 4 and 5. 2. iii) What this means is that while a is smaller than b and c in the roots, its first appearance as a multiple between b and c in multiples occurs at halfway between b and c multiples. It also means that this particular multiple gives "a" in square form. And this a in square form will be the full difference, not the total from zero to halfway between b and c when b and c are squared. 2. iv) So whereas a is not part of a b and c relationship in terms of the difference between b and c when b and c are roots, it is part of a specific half-way point relationship at a certain point in the multiplication of b and c before they are multiplied fully by themselves to become their respective squares. At this "sweet spot" multiplication level, the relationship of the difference of b and c and the halfway point in roots is reflected also with the ultimate difference between b and c as squares. and b and c multiplied by two times their difference also makes the halfway point's full amount (back to zero, not just back to b's multiple) an amount which will become the difference between b squared and c squared, which is a squared. 2. v) If we use non-Pythagorean triples, we find there is also a relationship which works between b and c, but it will not be a multiple of a. For example, with 7-8-9, when 8 and 9 are squared as b and c squared, the difference is 17. Halfway between 8 and 9 is 8.5, of course. And two times the difference of 8 and 9 is two times one. And two times 8.5 is 17. Two times 8, which is 16 and two times 9 which is 18 do bracket 17. And 17 becomes the ultimate amount between 8 and 9 squared. But 17 is not a squared, which is 7 times itself, or 49. 2. vi) So a principle which relates to the half-way point of difference for all triples, not only Pythagorean triples, and which uses the full difference times two, between b and c, relates all triples and gives us also the special case where the half-way point becomes a square, when the process is used for Pythagorean triples. 2. vii) This may explain why the special properties of the "Plimpton 322" Babylonian tablet about Pythagorean triples would show up. Image cached on Wikipedia here. 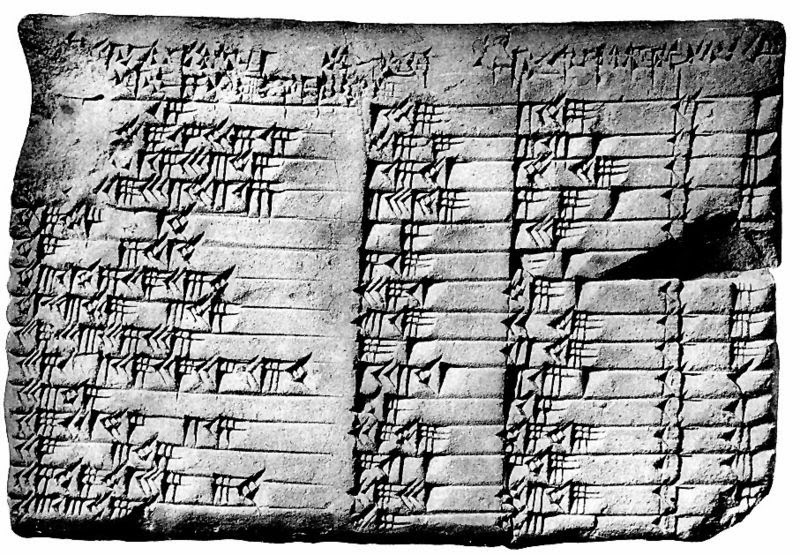 2. viii) And of course I have suggested, or argued above, in part A about squares in general, that the reason for the use of a sexagesimal system of Babylon and other early societies, is that squares themselves have a relationship to 24 in their difference, in so many cases (all odd roots which are not divisible by 3), while I did not cover how the even roots relate to 4 in difference and where the odd roots divisible by 3 fit into that. But suffice to say, for the moment, the special relationship of the halfway point in the difference between b and c, to the same difference multiplied by two, and the result for the halfway point's being related to a and in fact its being the square of a, which will become the difference between b and c when squared, is very interesting. 2. ix) This Pythagorean triple result at the halfway point in that special multiple of b and c related to two times their difference actually comes from a physical square. When the sides of two times b and that of two times c are drawn out physically, the halfway point will be reflected consistently, of course, as the corner point through all multiples of b and c, as long as b and c are multiplied by the same amount. But a square of the square of 4 and a square of the square of 5 do NOT share a multiple of 4.5 on their halfway point between their edges, thus not either on the diagonal point halfway on their corner. But the reason the difference is to be multiplied TWO times so as to find the "sweet spot" for the first occurrence of "a" squared, is that we are dealing with two sides, two edges, of a real square. we are considering a side of 4 in relation to itself, or of 5 in relation to itself, not comparing where squares of that size would relate to each other if overlapped. And only Pythagorean triples related to (using) 4 or 5 of the old unit (i.e., non-primitive 3-4-5 triples) will occur on the sides, of that rectangle 3-4 with hypotenuse related to 5; and if we were to use the old units, we would have to reduce the rectangle to a simple square to get a relationship of 1-1-square root of 2. In other words, 1-1 is like comparing anything to itself: it is not a rectangle, but itself a square, and the squares on its side relate as overlapped: a square of 1, then a square of 1 then a square of the square root of 2 as sides, not a whole unit at 2. This has a difference between b and c, but the halfway point will be short of halfway between 1 and 2 (which would be 1.5). Yet for our finding above, the halfway point has to be not only greater than 1, but relate to it in whole units, to be a Pythagorean triple. 2 times the difference between b and c would be 2, if c were a full 2 (that difference is of course 1, and 1 times 2 is 2), as would be the case for a whole-number Pythagorean triple. Half way would be 1.5. But our "a" is also 1. As such it can only occur in whole units. (Unlike 4.5, in our example of 3-4-5). And since the square root of two is less than 2, in such a way as to be not a multiple of any set of multiples of halfway between that and b, which is 1, the halfway point will not reach a whole unit of 1, ever. And thus will not give the next square size up in any unit. The only way is to add the whole 1 to itself and make the square the next size. But rectangles (non-squares) have the property which relates them potentially to a square of either side amount. We could have a square of 4 and include a square of 3 within it on the same corner. This means we can only consider Pythagorean triple relationships for where a square (of side 1) is increasing at intervals of 1 (so with a new side 2, side 3, side 4 ... of size 1 per unit). Any time we treat of the whole result as a 1 again (where 2 becomes a new 1, or 3 a new 1 ...) we have reset, as it were, the relationship of units in the sides to the relationship of units in the diagonal. But with Pythagorean triples, in whole numbers, what we are doing is finding a unit whose intermediate square (a halfway side amount, say, 4.5) will relate to that particular unit of 1 inside the 4 at the next square down and 1 inside the 5 at the next square up, and relate to all other expressions of multiples of sides of 4 and of 5 in such a way as we have seen above. I will write up the final item when I have time. The exact pattern which is found in primes, early on in their population of the whole number scale up to infinity, using the differences between squares (square numbers) as the counter of how many primes are between each square number. The pattern is complex but exact.